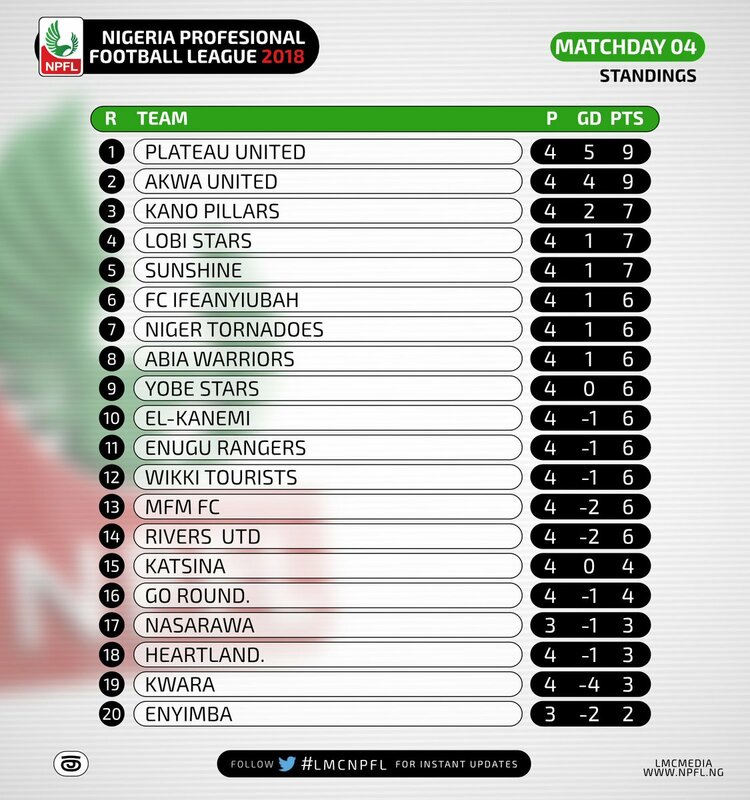 Cybereagles • View topic - 2018 Nigerian League Abruptly Ended - Lobi declared "champs"
2018 Nigerian League Abruptly Ended - Lobi declared "champs"
The steady climb up the table continues, from 20th to 18th and now 16th! Out of relegation zone, never to go back. Up Rangers!! Very good redemption victory for the yeye team from the coal city. The world is rotating back on its normal axis..
Rangers have put life back into their NPFL season after they defeated Heartland 1-0 in an Oriental derby played at the Dan Anyiam Stadium, Owerri on Sunday. Prior to the tie, the Flying Antelopes had lost their opening two matches while Heartland were yet to concede a goal after two games – both ending in scoreless draws with Sunshine Stars and Enyimba. After their surprise home loss to Lobi Stars, Rangers head coach, Gbenga Ogunbote opted to start only six players out of those that featured in the match in their game against the Naze Millionaires with Okey Odita earning his first game of the season while Bight Silas, Tayo Fabiyi, Ifeanyi George and Godwin Aguda took the places of Shedrack Francis, Ajani Ibrahim, Abu Azeez, Godwin Zaki, and Salau Ibrahim in the starting 11. Heartland’s Ramson Madu elected to stick with most of his players who battled the People’s Elephant to a standstill during the midweek encounter in Calabar with only two changes to the startlist: the introduction of John Chukwudi and Ndukwe Okoro in place of Abiodun Thompson (who failed a late fitness test) and Kingsley Salami who was dropped to the bench. It was a cagey affair early on but the visitors showed they were in no mood for another loss after their defeat to Akwa United and Lobi Stars and it was no wonder they were the first to record a shot on target after Christian Madu peppered Ebele Obi’s hands with a well struck free kick in the sixth minute. The Flying Antelopes showed they meant business further when they scored first to the chagrin of the Owerri faithful in the 10th minute after some hesitating from Heartland’s defenders off a free kick taken by Madu. The midfielder gave Silas a delectable pass which he graciously finished off with aplomb. Obi, in goal for the returnee topflight side was unable to prevent it from going in. Heartland were a more composed side after they went behind and they played their best game of the match thereafter but with no result to show for their efforts until they got what looked like a lifeline in the 44th minute when the centre referee, Thomas Nwite from Abia State, judged that a Rangers’ defender handled the ball in his box and he awarded a penalty kick. Heartland’s Lucky Emariojake stepped forward to take the spot kick but his effort came off the frame of the post of Rangers to the joy of Femi Thomas in goal for the Enugu side as the scoreline remained unchanged till halftime. On resumption of the second half, Heartland’s coach, Madu made an early substitution with the introduction of his side’s highest scorer last season, Francis Momoh who replaced John Chukwudi in the 48th minute and this added bite to the hosts attacking forays. Momoh was a constant thorn in the flesh of Rangers’ defence and he was unfortunate not to have leveled the tie on a few occasions he found his way into the vital area of their visitors or when he handed goal-bound assists to his teammates. Emariojake also had an opportunity to redeem his image in the 84th minute but his volley went wide and also when his effort came off the crossbar in the 88th minute to ensure that the game ended in a nervy affair at the Dan Anyiam Stadium. The away win has taken Rangers away from the drop zone to 16th on the league standings with three points from three games but Heartland first loss of the campaign saw them slide to 18th on the log with two points from three games. Good to see Femi Thomas back in action, even if it is for Rainjazz. He has been one of the better keeper in the NPFL over the decade, and I believe he is good enough for the main SE team. A bad club move (to Pillars) kept him out of action most of last season. Enyimba won their match day 4 game today against Nasarawa 1-0 and are now 15th on the table. Nassarawa vs Rangers comes up tomorrow Monday 29/01. Up Nasarawa! My source said it could have easily been 6-1 - the far better side won convincingly! Sorry, we can't help you. As the topic says, this thread is for Nigerian Premier League. You may wish to open another thread for Division 2 footy .